A batch of homemade bread is a necessary evil for any holiday feast. 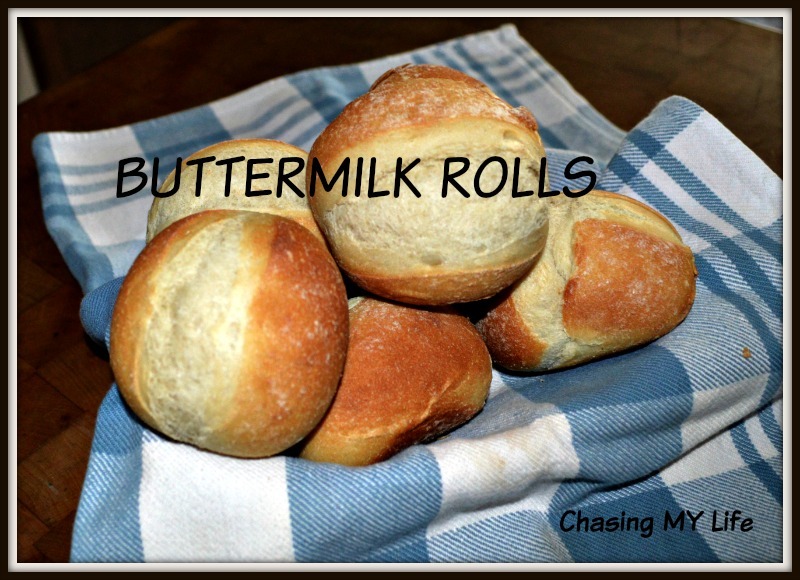 These rolls are buttery and golden and just plain delicious! Combine warm water, heat and 1 teaspoon of sugar, set aside until foamy, about 5 minutes or so. In a medium bowl stir together eggs, buttermilk, kosher salt, 4 tablespoons butter, and remaining sugar until well blended. Add yeast mixture and 3 1/2 cups of the flour, stirring until dough forms. Sprinkle for surface with remaining flour. Turn dough out onto floured surface and knead until slightly elastic. Add addictional flour as necessary. Place dough in greased bowl, turning to coat dough. Cover with saran and chill at least 8 hours or overnight. Grease 2 – 12 cups muffin tins. Punch chilled dough down and turn out onto a floured surface. Roll one half of the dough to a 12×16 rectangle 1/4 inch thick. Cut into 12 equal pieces. Gently roll each piece into a round and place in muffin tins. Repeat with the other half of the dough until all rolls are ready for baking. Brush again with any remaining melted butter. Cover with a cheesecloth towel and let rise in a warm place 1-1 1/2 hours until double in size. Bake rolls 20-25 minutes until golden brown. SHARING with FOODIE FRIDAY and TASTY THURSDAY. I love homemade bread and can almost taste your awesome Buttermilk Rolls! Hope you have a great week and thanks so much for the party!